Antrim midfielder Michael McCann has emerged as a major doubt for Sunday’s NFL clash with Leitrim after picking up a hamstring injury while playing for Cargin at the weekend. FRANK Fitzsimons has defended his side in the wake of criticism from opposing managers following Antrim’s opening two wins in the National Football League. This Sunday in Corrigan Park, the Saffrons will aim for a third successive win in Division Four when they host Leitrim. However, their round two defeat of Wexford at the West Belfast venue was overshadowed somewhat by allegations of “thuggery” made by Model County boss David Power. Carlow manager Turlough O’Brien claimed that Antrim “targeted” star forward Paul Broderick a week earlier. Fitzsimons though, has rubbished the claims and offered a robust defence of his side’s tactics. “I was asked about it (Power’s comments) after the game and I said it didn’t merit a comment,” said Fitzsimons. “We aren’t dirty. We are trying to tough obviously – you have to be. “I suppose if they are talking about us we must be doing something right. The Saffrons have put themselves in prime position to push for promotion from Division Four with back-to-back wins over Carlow and Wexford. One notable difference in the Antrim set-up this year is the strength-in-depth of the panel. For the League opener against the Barrowsiders in Dr Cullen Park, the likes of Ryan Murray, Brian ‘Bam’ Neeson, Niall Delargy, Mark Sweeney and Ricky Johnston were all on the bench. The return of Neeson along with the likes of Kevin Niblock, Michael and Tomas McCann and Kevin O’Boyle has given Fitzsimons and Gearoid Adams a few selection headaches but the Lámh Dhearg clubman feels competition for places is keeping everyone on their toes. “To be honest, picking the team is the hardest part of the job,” said Fitzsimons. “We have spoken to the players and told them if they want someone’s jersey, they’ll have it prove it at training and to take any chance you get. “There is an edge to the training, which is good to see. “There is a totally different atmosphere to last year because of that edge. “There is so much competition for places. I suppose it is the best position to be in for myself and Gearoid. 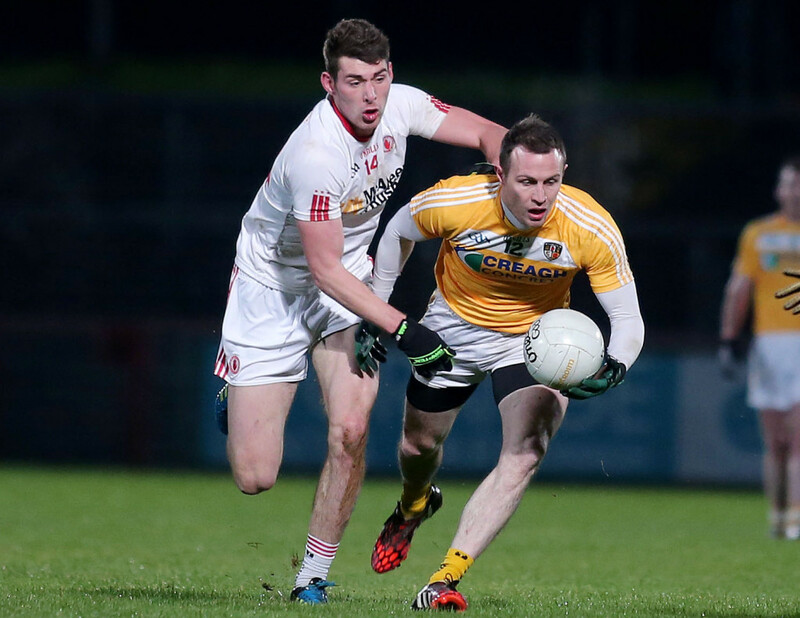 That strength-in-depth is set to be severely tested over the coming weeks as Antrim embark on a series of five games in six weeks which will decide their fate in the National Football League. Fitzsimons certainly isn’t getting carried away with Antrim’s fine start to the campaign and he is expecting another tough battle against Leitrim on Sunday. Midfielder Michael McCann looks set to miss Sunday’s clash after sustaining a hamstring injury while playing for Cargin in their O’Cahan Cup win over St Enda’s last weekend. Glenavy’s Owen Gallagher remains unavailable and Fitzsimons confirmed the NUI Galway student won’t return to the set-up until April.